Sometime a decision leads to something special. I painted my 1960s Welsh Rock Maple Dresser and it went from 'should we get rid of this' to 'a great background piece'. Versatile. It can be dressed for the season, theme or style. Today I added a late 40's early 50's Cast Iron Salter Scale bought by a new bride needing to weigh ingredients, and a Pottery Heron pitcher/vase to the mix. The Welsh Dresser was my first 'painting' of furniture for my home. 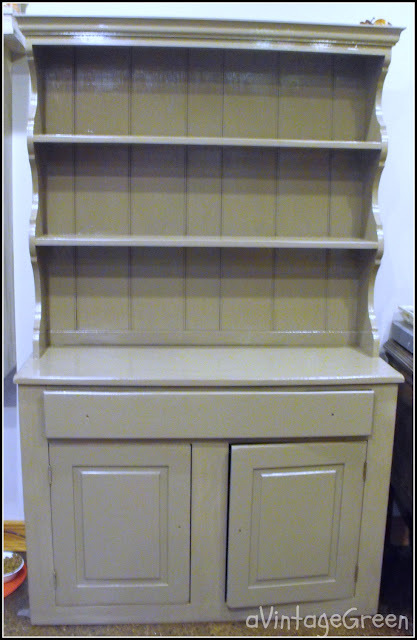 I have learned quite a bit about painting since this project but I continue to find the welsh dresser a prime spot for vignettes, displays and storage. It keeps moving around the kitchen. This month it stores tinned goods and large cooking pots in the bottom cupboard. When I look back on all the posts that the welsh dresser appeared in dressed in many guises I am somewhat amazed. 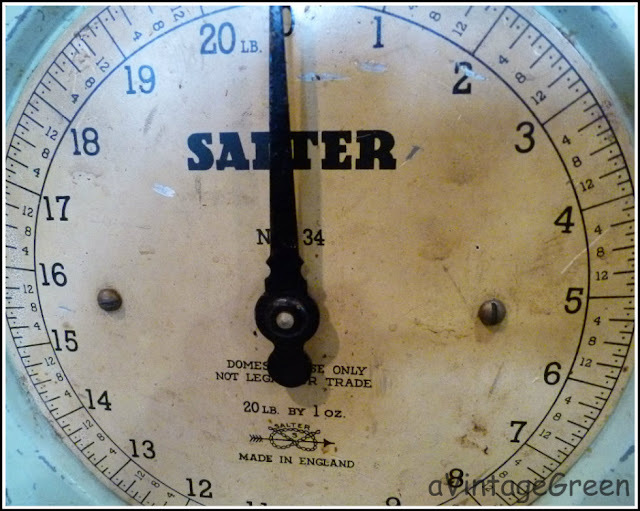 Today you can see four painted projects (well bits of them) as well as today's new addition of the Salter scale. Cast iron. Old. Well Used. Mine. Some things I find just have to stay. Older than vintage, cast iron and worn paint. I love the wear detail on the front corner. 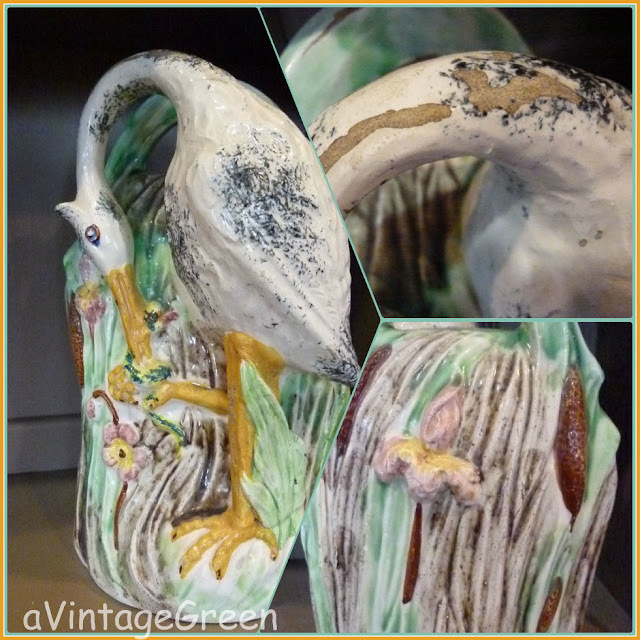 Another piece I haven't shared that also 'stays' is this very old heron pitcher/vase. Look at the great wear on the neck and the wonderfully naturalistic flowers and grasses. Maybe a tin glaze, sort of like Majolica, maybe Japanese. No marks to show 'who or what'. Some days I just get lucky with finds. Found years apart - the Salter Scale and Heron Pitcher/Vase. Both keepers. Pure eye candy...great scale and the Heron pitcher is wonderful! The cupboard is just beautiful and your header is, too...I just like everything!! Great finding! I love the paint colour on the cupboard! 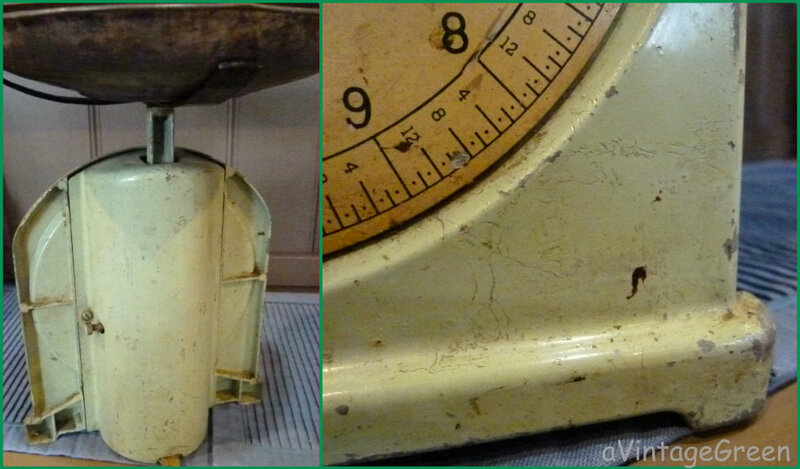 Of course who doesn't like a great looking scale! And the Heron is so pretty! thanks for always having great pictures & treasures to look at! Wow I love you Welch dresser. You have found some great treasures. I don't know if I would be able to give up that fantastic scale myself! Thanks so much for joining Friday pretties! Super great finds! I love your painted cupboard. Yes, I should say so! Definitely keepers! They are both just so charming with just the right wear! You always find such neat treasures. Love the scale most of all. Your display is very nice. Love the header too ... will have to check out those programs. 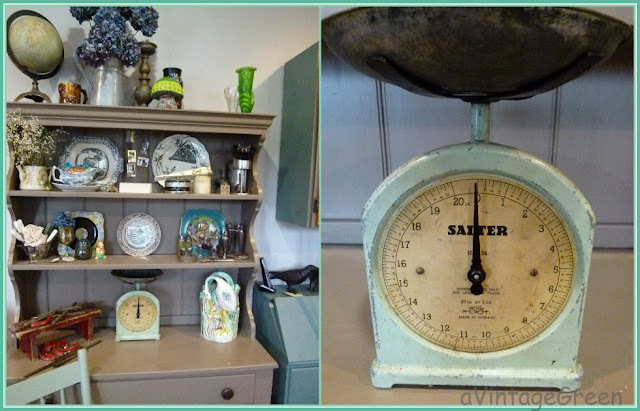 love the dresser...what a great display piece!